A Palestinian who has been on hunger strike for 71 days in protest at his detention by the Israeli authorities has been transferred to a hospital. The Israeli Prison Service said Thaer Halahla was moved from prison early on Tuesday after refusing to drink water. 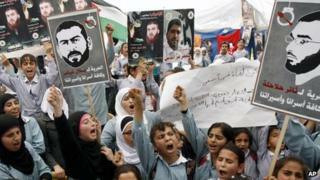 Israel's Supreme Court on Monday turned down a request by Mr Halahla and fellow hunger striker Bilal Diab to be freed. The International Committee of the Red Cross is extremely concerned about their health, and that of four others. ICRC delegates believe the six detainees who have been on hunger strike for between 47 and 71 days are in imminent danger of dying. "We urge the detaining authorities to transfer all six detainees without delay to a suitable hospital so that their condition can be continuously monitored and so that they can receive specialised medical and nursing care," said Juan Pedro Schaerer, the head of the ICRC delegation in Israel and the Palestinian Territories. "While we are in favour of any medical treatment that could benefit the detainees, we would like to point out that, under resolutions adopted by the World Medical Association, the detainees are entitled to freely choose whether to consent to be fed or to receive medical treatment." The ICRC expressed regret that the authorities had suspended family visits for the six men, as well as for the more than 1,600 detainees who have been on hunger strike in solidarity with them since 17 April. The EU missions in Jerusalem and Ramallah also said they were concerned about the hunger strikers and urged the Israeli government "make available all necessary medical assistance and to allow family visits". Palestinian Minister of Prisoner Affairs Issa Qaraqi says during the period of their protest both men have on occasion taken nutrients in fluid form. Mr Halahla and Mr Diab are among 308 Palestinians in "administrative detention", a controversial practice whereby people can be held without charge or trial when they are suspected of security offences. At an Israeli Supreme Court hearing last week Mr Halahla described administrative detention as a "slow death", adding: "I want to live my life with dignity. I have a wife, and a daughter I never met. I am on hunger strike because there is no other way." Mr Diab collapsed during the hearing and has been admitted to hospital. Judge Elyakim Rubinstein rejected their appeal on Monday, but expressed concern about their deteriorating condition and referred the military authorities to a legal clause which would allow them to be released on parole on medical grounds. Although administrative detention caused him "great discontent", it was "necessary when the material regarding the petitioner is intelligence material, the exposure of which would harm its conveyor or the methods in which it was obtained", Judge Rubinstein added. There are about 4,500 Palestinian prisoners in Israel's jails.